With ten metres opening up it seemed the right time to try building Roger G3XBM's latest project: the XBM10-2. 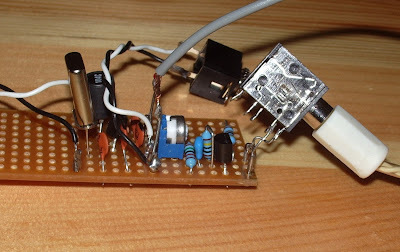 Roger describes it as probably just about the simplest CW transceiver possible for use on 10m, using just two transistors to produce about 60mW out. This was my first attempt at construction since my radiotherapy and chemotherapy and I found it to be quite a struggle. First of all I found it difficult to concentrate while trying to work out the perf board layout. After that I got a bit frustrated with constantly juggling three pairs of spectacles due to my eyes apparent inability to focus at different distances. I also found soldering difficult due to my hands shaking whenever I brought the iron bit close to a component. I created quite a few solder bridges which I then had to clean up. Construction took much longer than I would have taken a few months ago. But in the end it did work. Though not on ten metres yet. I'm waiting for a 28.060MHz crystal from the G-QRP club shop before I can try it out on the air. One issue I have found (which Roger also comments on) is that the rig has a major chirp. It is definitely not T9 and I don't know whether it is possible to improve on that. But at least it has character. If you hear a weak, chirpy signal near to the 10m QRP activity frequency give it a call. It might be me! Shouldn't be hard if I fix up a sked with a local. Chin up Julian, doing the project challenges the senses and communication between the brain and body. The more you use it the better the communication line will be. You took on a challenge and succeeded Julian. Reading your blogs, you are an inspiration to many.